The Splash Attack Action Net is a blast! Duncan Toys has provided me with the Splash Attack Action Net in exchange for an honest review. The Splash Attack Action Net is an inflatable floating net for use in a swimming pool (or any body of water where you swim). It retails for $17.99 and can be purchased HERE . 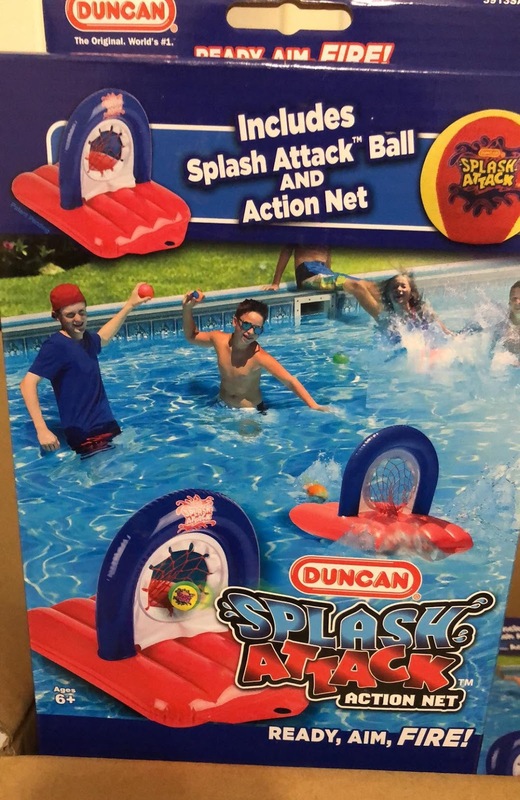 Each Splash Attack Action Net comes with a Splash Attack Water Skipping Ball and an instruction sheet for various game play options. The net is brightly colored in red, white and blue, so it is easily visible on the water's surface. Anyone can play this game, regardless of age. It's fun for all! You just inflate the net, place it in the water and let the fun begin! Follow the included instructions or make up your own game as you go. You can use one net or several nets for larger groups of people. The more the merrier! Play solo and practice trick shots to hone your throwing skills. Then show them off to your family and friends. Divide a large group of people up into teams and compete to win, or play one on one. If you don't want to let your net float freely in the water as you play, there is an optional weighted cord and weight that you can purchase separately which will prevent that. But I thought that chasing the net around the pool was part of the fun. It made it more of a challenge because it moved every time it was hit by a wave caused by us jumping, diving and just generally battling for the ball. And it's fun to watch the ball skip across the water as you try to hit the net. This game is a blast filled with lots of jumps, throws, tackles and splashes! My family enjoyed it immensely.